Went Thursday. It was cool. Sometimes I get the impression that the whole point of Kauai is to see how many different ways you can look at the Na Pali coast. Me this trip: 3. Ultralight flying on Thursday, drive/viewpoint/hike today, boat on Monday. Do I win? No. I could’ve done helicopter, kayak, and hike-in. Maybe next time. But the ultralight thing was, as stated, cool. Pics, then pros and cons. 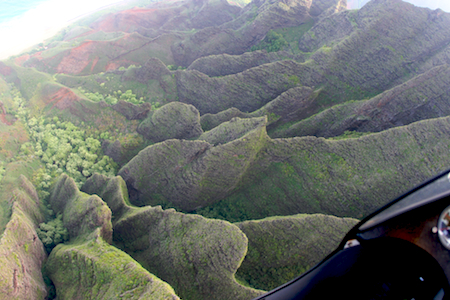 Hard bank left and, yes, these are cliffs at Na Pali (Kalalau Valley). This is me flapping my arms to maintain airspeed. BTW, the instructor (because this was a lesson rather than a tour) is the one who took the photos. His name was “Jim”, which I assume was a cover name. Â Kickin’ up spray and scaring the turtles. My turn at the tiller. 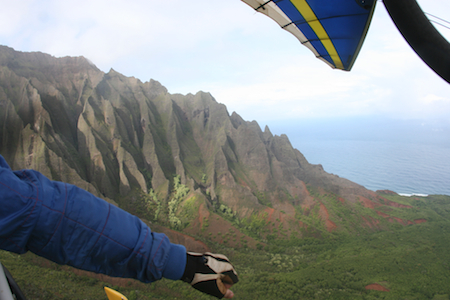 Best way to view Na Pali I’ve experienced *so far*. 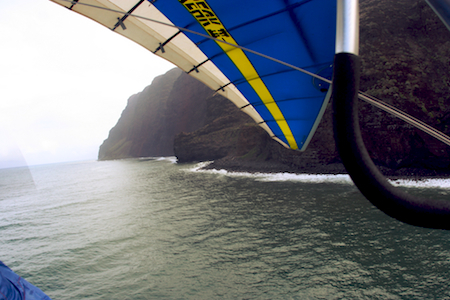 Perfect weather for it — it was raining everywhere on the island except where our little wing+engine was at. That tight left turn around the Kalalau Valley — I should have requested we do that part again. I sort of learned how to fly one of these to a very, very small extent. Cost $215 for a one-hour ride. Jim was a swell guy and all, but it’s kind of a snug fit. I was pretty much terrified for the first 20 minutes and I don’t like having to face up to being as big a wuss as I am for anything more than 7-8 minutes at any given stretch. But how much for the souvenir pics? When teh butterflies hit, you know you gotta do it. The souvenir photos only cost a little more than three times what it cost to rent a single kayak for a full day. That’s my current theory as well. To a point. So, is an ultralight flying *thingy* the same as a hang glider? Inquiring minds want to know. The only picture missing was one of the entire contraption — does it have an engine? Very cool indeed. Well, it’s the same as a hang glider with an engine and a couple of seats. I took a couple photos of the thing itself, but they weren’t all that interesting. But you can see the prop turning in a couple of the pics above. bk is right…this is an incredible experience..although not cheap…but what in life isn’t these days…afterall you get what you pay for…I was the instructor on this flight with bk…and yes my name really is Jim. 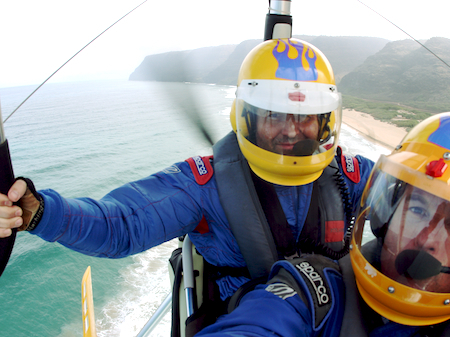 this has pictures of the Trike and should answer alot of questions…come fly with us…save some money and fly with the most experienced trike pilot on Kauai..
FWIW, I liked Jim better than I liked the company he used to work for. The other outfit (the guy Jim was working for) wanted to cancel my flight I was supposed to go on because there was a chance of rain (fortunately, my cell phone had died the day before, so they couldn’t get through). As it turned out, the weather at Waimea Canyon was about perfect.